Rick Moore has recently been appointed interim regent for OCCC’s Board of Regents by Governor Mary Fallin. He has been appointed to fulfill the term of former Regent Tony Tyler, said President Paul Sechrist. In the meantime, Moore said he is greatly looking forward to serving for OCCC again. “I taught American Federal Government from about 1993 until the fall of 2009,” Moore said. History and Geography Department Chair and History Professor Ray McCullar also chaired political science while Moore was an adjunct professor. “His student evaluations were always good, his class was always filled, he was always looking at what he could do to better serve students,” McCullar said. 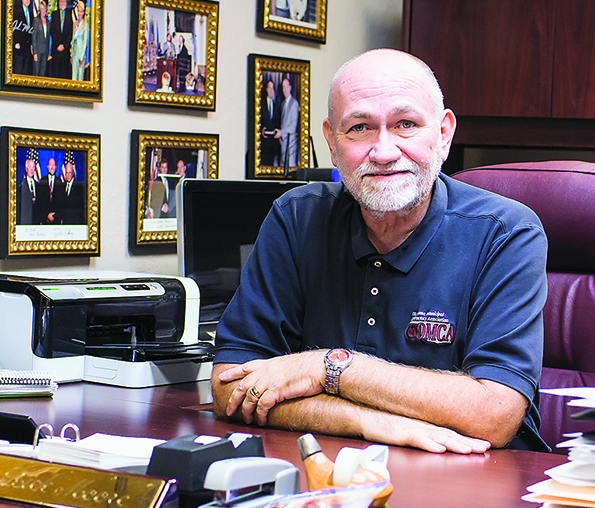 Moore no longer teaches since becoming the executive director of Oklahoma Municipal Contractors Association in 1999. He said he is also in the process of working on his doctorate in curriculum studies at Oklahoma State University. OMCA is a statewide trade association, Moore said. With his background of serving the state of Oklahoma, Moore has much to bring to the board. “Regent Moore brings a commitment to making our community a better place and understands that education and OCCC play a key role in creating our community’s future,” Sechrist said. The Board of Regents serves as the supervisor of the president, Sechrist said. When the board makes decisions at meetings, the president is then expected to implement the decision. Moore said he sees the opportunities OCCC gives to each individual who walks in the doors, and in turn what those individuals turn around and do for the community. “When I taught [at OCCC] I used to always hear that you have a large population of students in any college that are pretty well traditional college students, then you have some that aren’t. “You have some that are first generation college students, some that are there because they’ve lost their job in hopes to better themselves, some that are there for a licensing. “Not everybody is a four-year university student or beyond, but there should be a place they can go for some certification training. To contact Sarah Hussain, email editor@occc.edu.